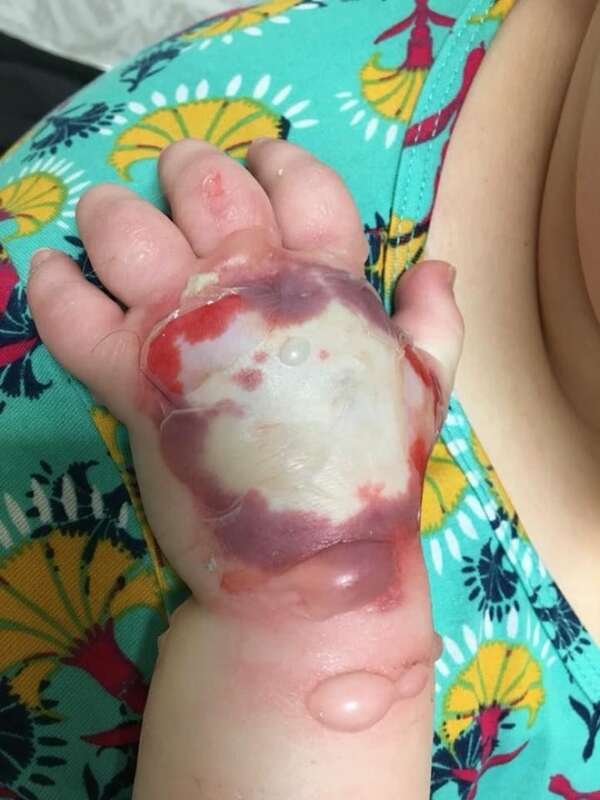 An Edmonton mother is worried her three-year-old daughter, who is recovering from open-heart surgery, sustained lifelong damage to her hand after a misplaced IV line caused the tissue to blister and decay. Jalena Gunther's daughter, Emmy, underwent surgery to repair a hole in her heart at the Stollery Children's Hospital on Tuesday. She was recovering well, but wasn't eating much, so she was hooked up to intravenous fluids at about 6 p.m. MT Friday. An hour later, Emmy started fussing and crying. Gunther figured it was because her child was still sore from surgery or overtired. She did her best to calm her daughter, but having not slept much in several days, left Emmy with her grandmother for the night and headed home. Emmy's grandmother texted Gunther at 8:30 p.m. Friday and said Emmy was still crying. She said she had requested more medication and asked for the doctor to check on the young girl. The doctor never came, Gunther said, and the nurses who visited didn't fully assess the toddler. She wasn't given more pain medication aside from what was already prescribed. 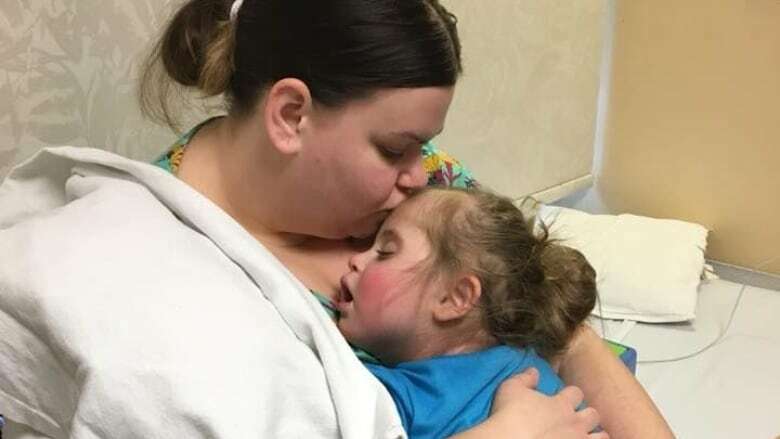 When a nurse came by in the morning to do an assessment, she saw that the hospital bed and the tape on Emmy's hand were wet, and immediately knew something had gone wrong, Gunther said. "She felt up her arm and felt that it was just stiff and swollen, which was the fluid in there," Gunther said. "She immediately started ripping off the tape and pulling everything off. That's when she'd seen her hand was very red, which was her skin starting to die." The IV line had gone interstitial, Gunther said, slipping out of the vein and spilling the fluid mixture of sugar, potassium and sodium underneath Emmy's skin. Her hand blistered and the skin turned white. The nurse immediately paged a doctor and plastic surgeon. Emmy underwent surgery to relieve the pressure in her arm. Doctors had to cut along her carpal tunnel, and on the inside and outside of her elbow, Gunther said. They cut the dead tissue and left the wound open, packing it with gauze and wrapping it in a bandage. On Sunday, the toddler underwent another surgery to close the wound and remove any excess dead tissue. 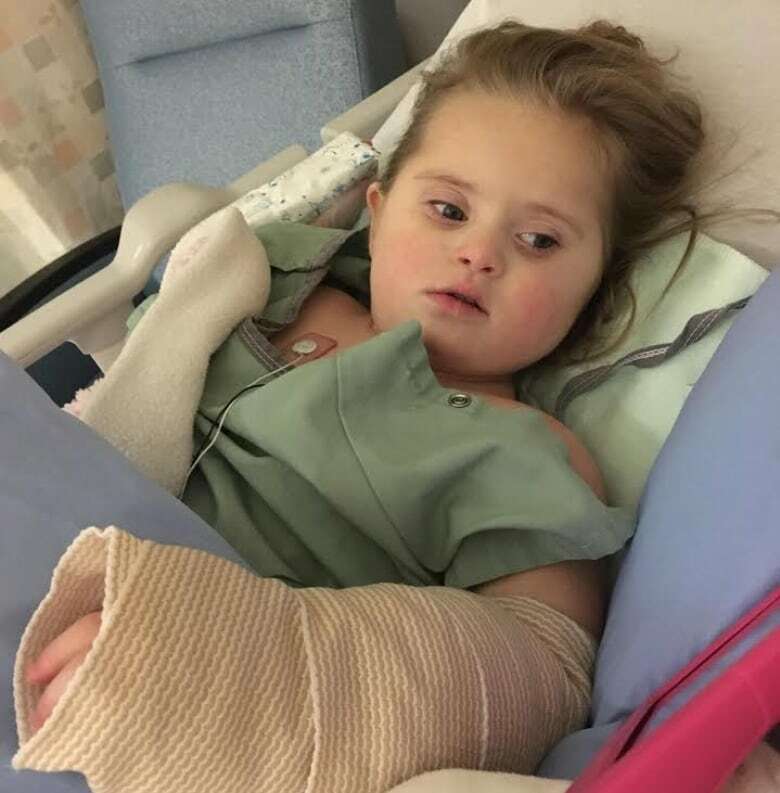 Emmy was set to leave the hospital early this week after her heart surgery, but is now expected to stay at least another two weeks for skin grafts, Gunther said. She said her daughter was supposed to be checked every 15 minutes throughout the night her IV failed. But she said that didn't happen. "I believe it was negligence," Gunther said. "Things were just missed and I really don't know why, truthfully. They knew she had the IV. It should have been checked. "I wouldn't know to check her IV. I assumed it was her heart, as did her grandmother. But that's something that they're trained to know and is in their protocol to check and … I don't know why they didn't do it, so to me, it is negligence." 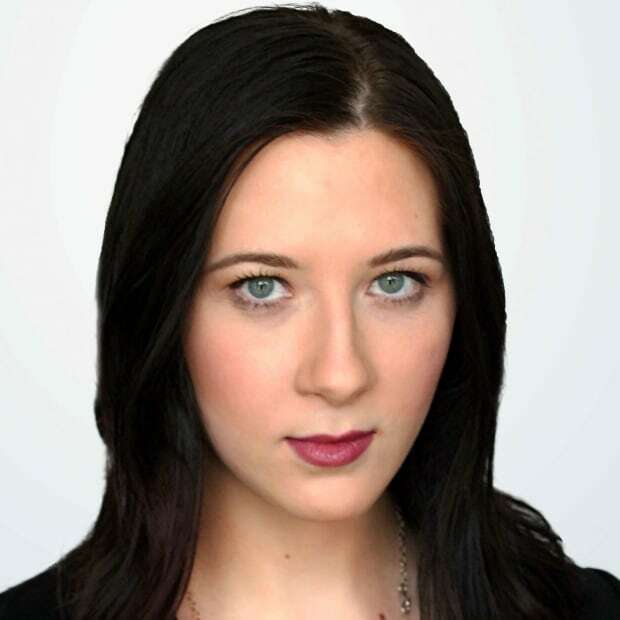 In a statement to CBC News, a spokesperson from Alberta Health Services (AHS) said the health authority's sympathies are with Emmy and the Gunther family, and that it has started a "quality review of the care" Emmy received. "We are doing all we can to make sure she receives the care she needs. We are involved with this family and reviewing the care that has been provided," the statement said. "We are very sorry about the complication that this little girl has experienced. Our standards of care should not result in this type of complication for any of our patients. AHS takes every patient or family complaint regarding care extremely seriously, and we are thoroughly reviewing the circumstances of this case.This includes closely reviewing the care provided to Emmy, and working closely with the family to answer any questions or concerns they may have. "We will continue to be available to them at any time." ​Gunther said she isn't sure whether her daughter's hand will heal normally. Emmy's arm muscles seem unaffected, she said, but the girl showed a delayed response in moving her hand and fingers — a major concern for Gunther, as Emmy is non-verbal and uses sign language to communicate. "We won't know for a few weeks what the use of her hand will be," Gunther said. "She'll likely need physio. Even just because she hasn't used it for so long, there will be retraining of those muscles." She said it's too early to tell what the long-term impacts of the injury could be. "If she can't have meaningful use of that hand or make a fist and move her hand, she won't be able to sign with her hand." Gunther said the doctor on call has apologized, as did the nurse who discovered the problem. She said she wants the Stollery to take disciplinary action where needed and review hospital protocols to ensure this doesn't happen again. Up until now, the family has had good experiences at the Stollery, Gunther said. Her son, Malachi, who is also three years old, is currently in the intensive care unit recovering from influenza. He has complex medical needs, Gunther said, so she has spent 70 days of the past four months in the hospital with her son. "We have had mistakes by nurses, but they've always been corrected instantly. Managers have always addressed them instantly, done retraining where they needed to and thankfully it was nothing that affected lifelong care and his life," Gunther said. "Most of the nurses here we love. Most of the doctors we love. They do try their hardest and do their best, but then when things like this happen, you question everything."